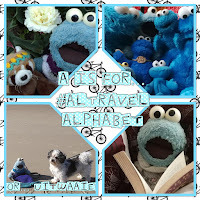 Every year me sweet bunny friend Dusana hosts the Altravelalphabet on Instagram. It so much fun, cuz me learn so much new words that have to do with travel and mental health. Me loves it! So... me participated again, just like last year and found some nice pictures to illustrate the words. Do you want to know the words? Here we go! It is Latin and means warmed by the Sun. Me love to sit in the sun in wintertime... Especially when it is cold outside and me just wanna warm up with tea and COOKIES hihi. But me also love to sit in the sun in the Summer. It just nice and warm. To dance artlessly, without particular grace or skill but with enjoyment. Me was breakdancing here and posing after a long spin. Me love to dance. When me hear music me like so shake shake shake me booty hihi. To travel in a purposeful manner towards a vague destination, that is coddiwompling. It one of me favorite words. Me love to coddiwomple. It brings you places, without even making plans for it. In the photo me coddiwompled to the forest (it in a zoo) and just enjoyed the snowy beauty. An old Scots word for Twilight, it literally means ‘daylight going’. Me thinks it a beautiful word. Me no have mucht dayligaun pictures, so me used this older one. We made it at the Castle of Haarzuilens when the Iceland Vulcanic ashes were in the air. It wasso beautiful. Antything that wakes you up. Like a puppydog and your friend you wants to play with you. Me like to be woken up by the smell of freshly baked COOOKIES too. O and cuddles are nice and a kiss on the nose. Hihi. Everything is better than been woken up by an alarm clock. An 18th century word meaning often very hungry. 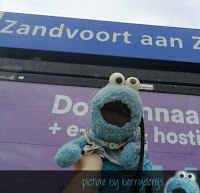 Me is always famelicose for COOOOKIES! Me bake them meself sometimes. Berry even made me me very own apron so me no get dirty while baking cookies. And eating cookies too, ofcourse. NOMMY. An old Scots term meaning to look at somebody while they are eating in the hope they give you something of their food. Me no wanna brag but me pretty good at groking. Me got these sweet googly eyes that just no one can resist. So... PLEASE gimme all your cookies. Well, this is a word that no does need an explanation right? It always nice to help other people, plushies and animals. Me love to help the bees in the garden with this insecthotel. Also me like to help you eat your COOKIES and help with Berry her work. And helping others to have fun. A rare word meaning forgiveness or a forgiving spirit. One of me sweetest lil friends is our own lil Bamboo. He is very forgiving and sweet and loveable. He truly has a ignoscency spirit about him. Me just love him so much for it too. A sharing of characteristics or origins/Blood relatives. 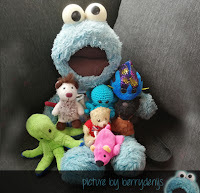 So for this picture me asked all me fuzzy and blue cousins to join me so we could show the similar features we have. Maybe you recognize lil Cookie who came to live with us last year. 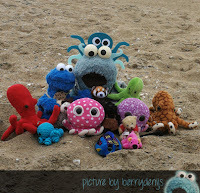 And... hey guys.... me is almost not in the picture hihi. Me also used this for a hide and seek challenge. A traditional custom or idea adherend to altough shown to be unreasonable. Well... me sometimes think moon is COOKIE. 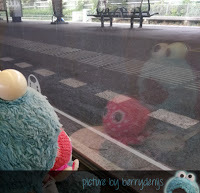 Me KNOW moon is no COOKIE, but when it full moon and me look outside and dream away it sometimes DO look like COOKIE. Me thinks that is a Mumpsimus right? 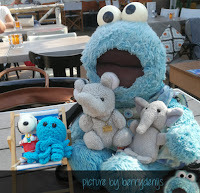 Because we had no photo, Berry drew this picture of me thinking moon is COOKIE. Nui is a small word for BIG, LARGE, MANY. Me have this very big Nijntje (MiffY) living in the city. Me like to visit her, although she makes me feel very tiny. But hey, it Nijntje. Me just love her. No matter if she is teeny tiny or very large. To walk about, to wander aimlessly. It kinda like the Coddiwomple... you just pick yourself up and go for a walk. It no matter where you go to. It no matter how long you stay away... we took this picture at me fave Zoo where we were ombambulating in the forest. Ancient Greek for an all-night feast or ceremony. Did someone say PARTY ALL NIGHT in Greek? Me LOOOOVE to party. Shaking me booty on the dance floor. And a party is not complete with some festive coloured party lights! This tonguetwister means ‘that makes money in any possible way’. One of me friends (Jennie the Hippo) pointed out that another word for this is ‘hustling’. Once me went on a workthingy with Berry and me got this T-shirt saying Vision, which is a sunscreen brand that me was advertising that day. This German word describes the feeling of returning home after an immersive trip, only to find it fading rapidly from your awareness. It sounds a little sad, but is very common. After a vacation or a day trip me always feel very happy and full of everything me did... and then normal life kicks in again. Another German word. It means the freedom of not being watched by a parent or supervisor, being alone at a place and having the ability to do whatever you want. This picture was taken at a Zoo in the Netherlands. That day almost no one was there. And that really gave a Sturmfrei feeling. To gossip or to talk idly & too much. 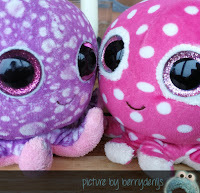 Me honestly no think Coral (right) and her sweety BFF Di-Lu (left) would gossip and talk idly about other people, octopi and plushies, but when they get together after not seeing each other for some time they sure do talk a lot! Me no mind. They are so cute! Me submitted this one for the alphabet. Uitwaaien means that you go to a place where there is a lot of wind, so you can let the wind blow all your cares away. You can see how windy it was by the sea because our doggy’s hair is dancing in the wind. Me love to let the wind blow away any cares me had. Usually we do this on the island Texel. An unexpected and inexplicable change in a situation or in someones behavior. 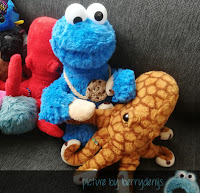 Like, what if me COOKIE monster suddenly would be a YOGHURT monster instead? That would be a sudden change in me behavior right? Well... no worries. Me no Yoghurt monster. Me always will be the sweetest and bluest COOKIE lover. A person or plushie or animal that travels on foot. Me love walking and wandering wayfaring and coddiwompling on foot. When you travel on foot you no travel too fast. And that is the best way to see the most beautiful things. Like a bird in the tree or these little purple flowers. Pretty huh. A present given among the ancient Greeks and Romans to a guest or a stranger. Me like to present you a piece of this nommy cinnamon apple cake, because sharing is caring. 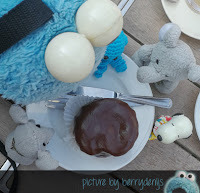 And me just love to share me nommies with all of you! It means grumbling, complaining. Me sure yumpled for a moment when these beautiful flowers called Narcissus Apple Pie did NOT - me repeat NOT - taste of smell like apple pie AT ALL! But hey... it was a short yumple, cuz these daffodills sure were very very pretty. Zneesy is an old 18th century slang word for cold, frosty weather. It sounds funny. I been a while since it was Zneesy weather out here. We have been treated to an early Spring. So... me used another snow covered picture me also used for the Coddiwomple. So there you have it. The complet Altravelalphabet 2019! It was awesome to participate again and me learned so many new words. Me hope me can play along with this next year too. Well... bye bye for now. 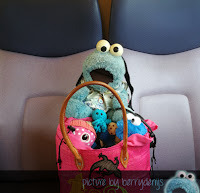 Me is going to coddiwomple to the cookie jar, because me is famelocosi for COOOOOOKIES! Nommy. Ah the sea. 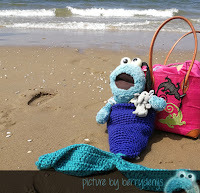 Me love the sandy beaches, the soaring seagulls and the waves rolling on to the beach… it so soothing… Luckily in the Netherlands we have loads of beaches to choose from. There are many great places to go and it even better with friends! 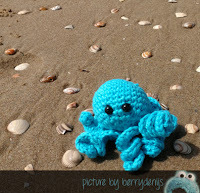 That why over the Summer me had not one but two instameets by the sea. Me gonna tell you all about them. O boy… me was a little nervous for this instameet. 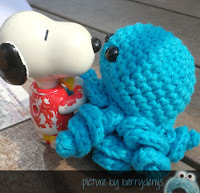 You know the little elephant rebels can be naughty… Snoopy (voyage of the beagle) can be very naughty… O boy o boy, me was going to have me hands full with them! 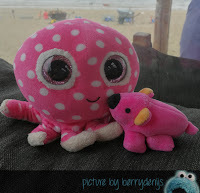 So… me decided to bring a little octopus friend (who was nameless until the next ocean side instameet) who – if necessary – would have enough arms and legs to hold everyone. Luckily we just had an awesome time! 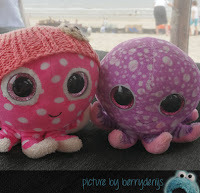 First we met for coffee and some nommies in Scheveningen (that is near The Hague). 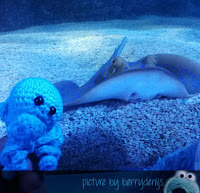 Than we went to SeaLife. That was so much fun! 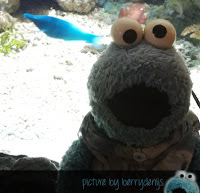 It such a beautiful aquarium about the oceans of the world. 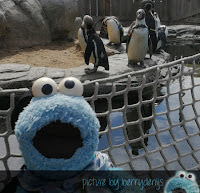 Me also loved the penguin habitat. They looked so friendly. 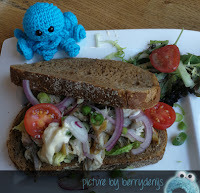 O and me loved all the colourful fishees too. To end the day we went to the beach. 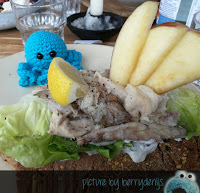 You must now that SeaLife Scheveningen lies on the Boulevard that separates the city from the beach. 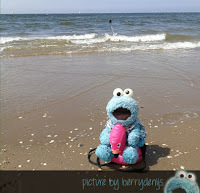 So… we left the Aquarium, crossed the road and… enjoyed some well-deserved beach time! It was an amazing Summer day too. O it been a while since February when me and Coral met up with Jaques, Jaqueline and the family in Amsterdam. So me was really excited to see them again. 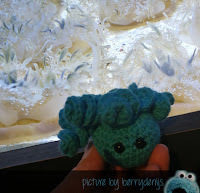 This time not only Coral, but also lil Cookie and Maddie the fish went along. 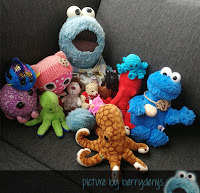 O and the little blue octopus too. 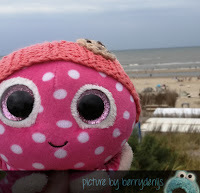 After a fun and relaxing train ride we made it to Zandvoort at Sea. 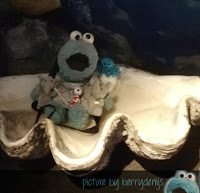 The humom of Jaques, Jaqueline and the rest had picked out this cute beach bar. It was a little far from the train station but so worth it. While we cuddled on the couch, our humans had a great time too! Me think you can see that in these pictures right? 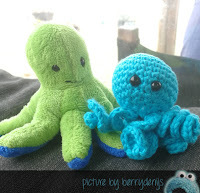 O and the sweet humom of Jaques and Jaqueline gave our lil blue octo a name too: Azuro. He was so happy! Well… those were great instameets again! Me had two more in August. Me will talk about those next time.